New endoscopic spine surgery in Michigan for disc herniation and/or spinal stenosis. Dr Zamorano and her team are the first and only performing this technique in MI. 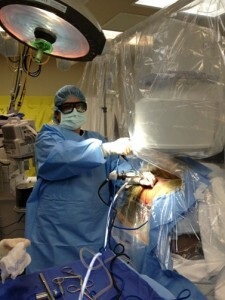 Dr. Zamorano performing transforaminal endoscopic discectomy and foraminotomy. The Michigan Brain and Spine Surgery Center is the first and only practice in Michigan offering the transforaminal endoscopic approach for discetomy and foraminotomy. This minimally invasive technique is an excellent option for patients with disc herniations and/or spinal stenosis. The procedure is done quite differently from traditional spine surgery. A small incision is made in the side of the patient, and the entire procedure is performed through a small scope. Most of the original disc is preserved and only the damaged portions of the disc are removed. This technique has been performed in Europe for nearly a decade and has finally arrived in Michigan. The surgery can be performed on patients with prior spine surgery that have a recurrence of disc herniation, far lateral discs, extruded discs, and spinal stenosis. Thanks to the combination of a growing body of endoscopic knowledge of the anatomy of the intra- and extraforaminal areas, the radiological determination of orientation points for the working zone around the dorsolateral area of the anulus by Kambin and the availability of smaller endoscopes, lateral access became possible. Different types of lateral access have been described by Anthony Yeung, Thomas Hoogland and Sang Ho Lee, et al. The TESSYS® method and joimax® technology combines the access methods and techniques applied by multiple users, as published in numerous articles, and has been applied successfully in thousands of procedures. To remove a herniated disc, the TESSYS® method uses a lateral, transforaminal, endoscopic access path, classifiable as a surgical access method that minimizes patient trauma. Sequestered herniated disc tissue is completely and directly removed through the foramen, which is gradually extended with special reamers and instruments, while the patient is in a stable lateral or prone position and responsive throughout surgery under analgesic sedation. The TESSYS® surgical method is also performed in hospitals and ambulant surgical centers. 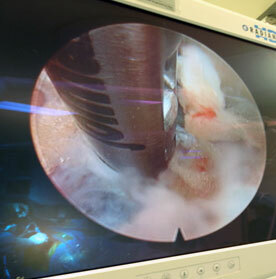 The endoscope removes portions of a herniated disc. the minimally invasive endoscopic approach allows for preservation of all stabilizing structures – ie the ligaments, muscles and bones. you will be able to return significantly faster to your everyday life. Who can benefit most from this procedure? Nearly all types of herniated discs can be removed – even those which are difficult to treat with some other methods. It is especially valuable for patients who had already had previous spine surgery and for lateral disc herniations. That’s what you can count on! The TESSYS® method can be used to remove almost all herniated discs and sequesters– irrespective of their position – through the lateral, transforaminal access under analgesic sedation. Disc material is visualized through the endoscope. The TESSYS® surgery is indicated for all radicular symptoms caused by herniated discs that were not improved by conservative therapeutical methods. Cauda equina syndrome indicates immediate grounds for surgery. Every surgical procedure on a spinal disc, including the TESSYS® surgery, has to be carefully prepared by using Magnetic Resonance Imaging (MRI) and/or computer tomography (CT), as well as multiple conventional x-ray images. Intraoperative discography and chromography provide final certainty in definitive determination of the herniated disc position. They are conducted using the needle included in the TESSYS® disposable set. Check whether the nerve is free again and remove the instruments. Before surgery, your doctor will examine you thoroughly. She will ask you about your complaints and will do some diagnostic imaging. In general, this will be a magnetic resonance image (MRI) or sometimes also a CT scan. During the surgery you will lay on your side. Your doctor will make a small incision of a few millimeters on your lateral back and will create a channel directly to the site of the disc herniation. For this purpose, the tissue is gently widened – there is no need to cut muscles or ligaments. For access into the spinal canal a natural opening is used – the intervertebral foramen. 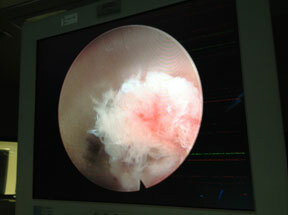 Through this “keyhole” from your back to the site of action, the tissue pressing on the nerves can be removed. Your doctor will enter with a special endoscope into this surgical field. With this foraminoscope, she has a fully lit and sharp image of all structures within the spinal canal. With fine forceps and other special micro instruments, she will very carefully and specifically remove the herniated disc material. Finally, the surgeon checks whether the affected nerve fibers are free again. Only then, she removes all the instruments and closes the small incision with one or two stitches and a patch. As a rule, you will be free of pain immediately after surgery, after about two hours, you can get up again. Your doctor will tell you when you can go back home and return to your everyday life.